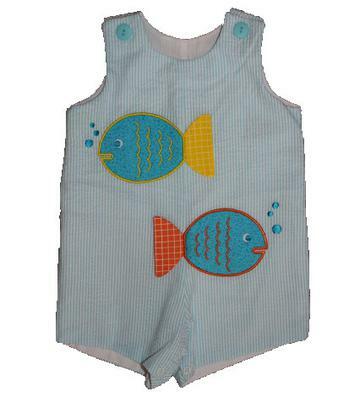 These fish are absolutely adorable on little boys. The aqua and white seersucker shortall is adorable with two loose tail fish on the front. There is aqua buttons on each shoulder to get on/off easily and snaps on the inside of the legs to accommodate a diaper change. This adorable outfit is 35% cotton and 65% polyester.